From Up on Poppy Hill (Japanese: コクリコ坂から, Hepburn: Kokuriko-zaka Kara, "From Coquelicot Hill") is a 2011 Japanese animated drama film directed by Gorō Miyazaki, scripted by Hayao Miyazaki and Keiko Niwa, animated by Studio Ghibli for the Nippon Television Network, Dentsu, Hakuhodo DY Media Partners, Walt Disney Japan, Mitsubishi, and Toho, and distributed by the latter company. It is based on the 1980 serialized Japanese comic of the same name illustrated by Chizuru Takahashi and written by Tetsurō Sayama. The film stars the voices of Masami Nagasawa, Junichi Okada, Keiko Takeshita, Yuriko Ishida, Jun Fubuki, Takashi Naito, Shunsuke Kazama, Nao Ōmori and Teruyuki Kagawa. Set in 1964 Yokohama, Japan, the film tells the story of Umi Matsuzaki, a high school girl living in a boarding house, 'Coquelicot Manor'. When Umi meets Shun Kazama, a member of the school's newspaper club, they decide to clean up the school's clubhouse, Quartier Latin. However, Tokumaru, the chairman of the local high school and a businessman, intends to demolish the building for redevelopment and Umi and Shun, along with Shirō Mizunuma, must persuade him to reconsider. From Up on Poppy Hill premiered on July 16, 2011, in Japan. It received positive reviews from most film critics and grossed $61 million worldwide. An English version was distributed by GKIDS; it was released to theaters on March 15, 2013, in North America. Umi Matsuzaki is a sixteen-year-old student attending Isogo High School living in 'Coquelicot Manor', a boarding house overlooking the Port of Yokohama in Japan. Her mother, Ryoko, is a medical professor studying abroad in the United States. Umi runs the house and looks after her younger siblings, Sora and Riku, and her grandmother, Hana. College student Sachiko Hirokouji, and doctor-in-training Miki Hokuto, also live there. Each morning, Umi raises a set of signal flags with the message "I pray for safe voyages". One day, a poem about the flags being raised is published in the school newspaper. Shun Kazama, the poem's author and a member of the journalism club, witnesses the flags from sea as he rides his father's tugboat to school. At Isogo High, Umi meets Shun when he participates in a daredevil stunt for the newspaper, leaving Umi with a negative first impression. Umi later accompanies Sora to obtain Shun's autograph at the Quartier Latin, an old and dilapidated building housing Isogo High's clubs. Umi learns that Shun publishes the school newspaper, along with Shirō Mizunuma, Isogo High's student government president. She ends up helping on the newspaper. Later, Shun convinces the other students to renovate the building after a debate on the future of the Quartier Latin, which may be demolished. At Umi's suggestion, the female student body cooperates with the other students. Back at 'Coquelicot Manor', Umi shows Shun a photograph of three young naval men. One of these men is her deceased father, Yūichirō Sawamura, who was killed in the Korean War. Shun is stunned to see the photograph. At home that night, he opens a notebook to reveal he has a duplicate of Umi's photograph. He questions his father, who reveals that Yūichirō arrived at their house one evening with a young Shun, shortly after the end of World War II. The Kazamas had recently lost their infant, so they adopted Shun. Upon discovering that he is avoiding her, Umi eventually confronts Shun, who reveals they may be siblings. Having checked the city records, Shun discovers that both their names are in the Sawamura family registry. Umi is able to hide her feelings from Shun, and they continue as friends. When the renovation of the Quartier Latin is complete, the Kanagawa Prefectural Board of Education decides to proceed with the building's demolition. The students nominate Shun, Umi, and Shirō to visit Tokyo and meet with Tokumaru, a businessman and the school board's chairman. 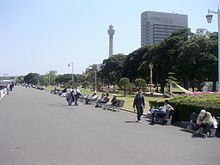 The trio travels through the city, which is in preparation for the 1964 Summer Olympics, and successfully convince Tokumaru to visit the Quartier Latin. After Shirō leaves the group, Umi professes her love to Shun, and he reciprocates her feelings in spite of their situation. After she returns home, Umi discovers that her mother, Ryoko, has returned. Ryoko reveals that Shun's father was Hiroshi Tachibana — the second man in the photograph. In 1945, Tachibana was killed in an accident on a repatriation ship. Shun's mother died in childbirth, and his other relatives were killed in the atomic bombing of Nagasaki. However, Ryoko was unable to raise Shun, as she was pregnant with Umi during her time as a medical student. Yūichirō registered the child as his own to avoid leaving Shun as an orphan in the confused postwar years, but Shun was eventually given to a local couple, the Kazamas. Umi, however, still has concerns. Tokumaru visits the Quartier Latin the next day and, impressed by the students' efforts in renovating the building, he decides to cancel the demolition. Umi and Shun are soon summoned to the harbor. They meet Yoshio Onodera, now a ship's captain, who was the third man in the photograph, and the sole survivor of the three. Confirming that Umi and Shun are not related by blood, Onodera tells the full story of the three naval men in the previous era. With everything resolved, Umi returns to Coquelicot Manor and resumes her daily routine of raising the flags. Masami Nagasawa as Umi Matsuzaki (松崎 海, Matsuzaki Umi), the oldest daughter of a family that runs a lodging house. Young Umi, in flashbacks, is voiced by Aoi Watanabe, and both versions of the character are voiced by Sarah Bolger in the English-language version. In the series she is nicknamed "Meru". "Umi" and "Mer" means "sea" in Japanese and French respectively. Junichi Okada as Shun Kazama (風間 俊, Kazama Shun), the school newspaper president whom Umi takes an interest in. Shun is voiced by Anton Yelchin in the English-language version. Okada also provides the uncredited voice of Yuichiro Sawamura (澤村 雄一郎, Sawamura Yūichirō), Umi Matsuzaki's deceased father. Keiko Takeshita as Hana Matsuzaki (松崎 花, Matsuzaki Hana), Umi's maternal grandmother and owner of boarding house. Hana is voiced by Edie Mirman. Jun Fubuki as Ryoko Matsuzaki (松崎 良子, Matsuzaki Ryōko), Umi's mother, who is a medical professor studying in the United States. Ryoko is voiced by Jamie Lee Curtis in the English-language version. Yuriko Ishida as Miki Hokuto (北斗 美樹, Hokuto Miki), a doctor-in-training staying at Coquelicot's apartment. Miki is voiced by Gillian Anderson (who voiced Moro in the English-language version of Princess Mononoke, a previous Ghibli production) in the English-language version. Nao Ōmori as Akio Kazama (風間 明雄, Kazama Akio), Shun's adoptive father. Akio is voiced by Chris Noth in the English-language version. Takashi Naito as Yoshio Onodera (小野寺 善雄, Onodera Yoshio), a ship captain and an old friend of Umi and Shun's parents. Onodera is voiced by Bruce Dern in the English-language version. Shunsuke Kazama as Shirō Mizunuma (水沼 史郎, Mizunuma Shirō), the student council president and Shun's friend. Shirō is voiced by Charlie Saxton in the English-language version. Kazama also provides the uncredited voice of Hiroshi Tachibana (立花 洋, Tachibana Hiroshi), Shun Kazama's deceased father. Teruyuki Kagawa as Chief Director Tokumaru (徳丸理事長, Tokumaru Rijichō), the chairman of the high school and a businessman living in Tokyo. He is based on Tokuma Shoten president Yasuyoshi Tokuma. Tokumaru is voiced by Beau Bridges in the English-language version. Haruka Shiraishi as Sora Matsuzaki (松崎 空, Matsuzaki Sora) and Tsubasa Kobayashi as Riku Matsuzaki (松崎 陸, Matsuzaki Riku), Umi's younger siblings; Sora is voiced by Isabelle Fuhrman and Riku is voiced by Alex Wolff and Raymond Ochoa in the English-language version. Rumi Hiiragi as Sachiko Hirokouji (広小路 幸子, Hirokōji Sachiko), an art college student staying at Coquelicot's apartment; Aubrey Plaza voices Hirokouji in the English-language version. Eiko Kanazawa provides the voice of Saori Makimura (マキムラ サオリ, Makimura Saori), a boarder at Coquelicot's house; Christina Hendricks voices Makimura in the English-language version. Toshimi Kanno and Aoi Teshima voice Nobuko (信子, Nobuko) and Yuko (悠子, Yūko) respectively, Umi's friends and classmates; Emily Osment voices Nobuko and Bridget Hoffman voices Yuko respectively in the English-language version. The cast includes director Gorō Miyazaki with the voice of Isogo High School's world history teacher. In the English version he is voiced by Ronan Farrow. Jeff Dunham voices Gen in the English-language version. Ron Howard voices Philosophy Club's president in the English-language version. The 1964 Olympic flame. Tokyo Olympics was a symbol of the new Japan. In the film, Umi's father was killed when his supply ship was sunk by mines in the Korean War, and Shun's biological father died aboard a repatriation vessel after the end of the Second World War. Following Japan's defeat in the Second World War, the Supreme Commander for the Allied Powers (SCAP) assumed control over the Japanese merchant marine to return repatriates to their homelands. At the start of the Korean War, those ships, together with their Japanese crews, were pressed into service by the US military to carry forces and supplies to Korea. Japanese vessels played a significant role at the Incheon and Wonsan landings. The shipping firm Tozai Kisen was among the most prominent firms involved, concluding "an agreement with the US military’s Japan Logistical Command (JLC) to provide 122 small vessels and around 1,300 crew for transport and landing work". According to estimates, 56 Japanese sailors and labourers were killed in the Korean War zone in the first six months of the war alone; 23 of the deaths occurred when Japanese-crewed ships were sunk by mines. Official estimates of the total number of Japanese killed in the Korean War have never been published, nor have the U.S. or Japanese governments officially recognised the role of Japanese non-combatants in the Korean War. The 1960s saw an escalating increase in student activism and campus revolts in Japan as well as in other parts of the world. A house in Yamate, the Yokohama neighborhood where From Up on Poppy Hill is set. From Up on Poppy Hill was officially revealed as the new Studio Ghibli film for 2011 on December 15, 2010. It is based on the 1980s shōjo manga of the same name by Tetsuo Sayama and Chizuru Takahashi. It was revealed the director Gorō Miyazaki would be directing. Gorō Miyazaki is the eldest son of Studio Ghibli's co-founder and acclaimed director Hayao Miyazaki; he made his directorial debut in the 2006 film Tales from Earthsea. From Up on Poppy Hill is his second work. Much like with other Ghibli films, the film is a co-production with Studio Ghibli, Nippon Television Network, Dentsū, Hakuhōdō DY Media Partners, Walt Disney Japan, Mitsubishi Corporation and Tōhō. In a press interview given after the 2011 Tōhoku earthquake and tsunami, it was announced the film's production was affected by the rolling blackouts imposed after this disaster. In particular, the animation process was forced to proceed in the night to minimize disruptions. When pressed about the progress, it was revealed that the animation was "about 50% completed", though it was added that the "animation would have otherwise been over 70% completed without the disaster". However, Hayao Miyazaki assured the public that the film would still be released on July 16, 2011, as previously announced, saying that it was their responsibility to do so. Gorō Miyazaki stated that while most of the staff was not affected by the disaster, there were several "who did go through a period of mental affectedness because of what happened and that took some time to recover from." Gorō Miyazaki initially researched Yokohama, intending to be faithful to the city's historical details. However, after realizing that "simply re-enacting something of the time may seem real enough but may not necessarily be beautiful". Miyazaki decided to show the location as "shimmering and bustling with life" from the viewpoint of the characters. In designing the Quartier Latin, Miyazaki worked with the art directors who added ideas about the "amalgamation of clutter in the house's many rooms" and attempted to "look at the architecture of the building, but to also remember back to my college years and the clutter and filthiness that [Miyazaki] lived through". The film's animation directors are Akihiko Yamashita (Suikoden III opening, Howl's Moving Castle, The Secret World of Arrietty), Atsushi Yamagata (InuYasha the Movie, Origin, Brave Story) and Kitarō Kōsaka and its most-known key animators include Makiko Futaki, Shinji Ōtsuka, Takeshi Honda, Takashi Hashimoto, Hideki Hamasu, Atsuko Tanaka, The Secret World of Arrietty director Hiromasa Yonebayashi and Hiroyuki Aoyama. The main voice cast members were officially unveiled on May 13, 2011. It was announced that actress Masami Nagasawa would voice Matsuzaki, the main character. This was Nagasawa's first voice acting role in a Studio Ghibli film. In addition, Jun'ichi Okada, a member of the Japanese band V6, would be voicing Shun Kazama, a member of the school newspaper publishing team. Additionally, Jun Fubuki, Keiko Takeshita, Takashi Naitō, Teruyuki Kagawa, Yuriko Ishida, Nao Ōmori and Shunsuke Kazama would voice other minor characters. In June 2012, it was announced that a North American dub would be recorded and that it was being executive produced by Kathleen Kennedy and Frank Marshall, written by Karey Kirkpatrick and directed by Gary Rydstrom. The cast members of the dub include Sarah Bolger, Anton Yelchin, Ron Howard, Jeff Dunham, Gillian Anderson, Chris Noth, Ronan Farrow, Isabelle Fuhrman, Emily Osment, Charlie Saxton, Alex Wolff, Beau Bridges, Jamie Lee Curtis, Bruce Dern, Christina Hendricks, Elisa Gabrielli and Aubrey Plaza. The score of From Up on Poppy Hill was composed by Satoshi Takebe. In December 2010, it was announced that singer Aoi Teshima would sing the film's theme song, "Summer of Farewells — From Up on Poppy Hill" (「さよならの夏～コクリコ坂から～」, "Sayonara no Natsu ~Kokuriko-zaka kara~"). The 1961 song "Ue o Muite Arukō" (「上を向いて歩こう」), better known in English-speaking countries as "Sukiyaki" and performed by Kyu Sakamoto, is included in this film as one of its insert songs. The instrumental version of this song was later released in the United States under the title of "Sukiyaki" by musician Kenny Ball. This song was chosen for the film because From Up on Poppy Hill is set in 1963, the year that this song debuted and became a hit in America. The soundtrack album was released by Tokuma Japan Communications on July 13, 2011. It contains the film score as well as six insert songs and the theme song. From Up on Poppy Hill was released in Japanese cinemas on July 16, 2011. It debuted at third placing in the Japanese box office, behind Harry Potter and the Deathly Hallows – Part 2 and the dual-release Pokémon anime film Victini and the Black Hero: Zekrom and Victini and the White Hero: Reshiram. It managed to gross approximately 587 million yen and attracted around 450,000 viewers. Furthermore, an exhibition, THE ART OF From Up On Poppy Hill was held to coincide with the film's release. This exhibition featured more than 130 art and storyboards used in the making of this film. It was held from July 23 to 28, 2011 in the Seibu Ikebukuro Main Store in Tokyo. The exhibition was later moved to Sogo's Yokohama Branch Store from August 10 to 15, 2011. The movie was released in France on January 11, 2012, as La Colline aux coquelicots by Walt Disney Pictures. It gathered over 287,281 viewers in its four weeks of exhibition far more than Tales from Earthsea (in 2007, with 143,641 viewers). On August 17, 2011, it was announced that From Up on Poppy Hill would be one of the Japanese films being showcased at the 2011 Toronto International Film Festival, which was held from September 8 to 18, 2011. It was also revealed that the film would be showcased in the "Japan International Premiere" section, which is part of the "Contemporary World Cinema" event in the festival. The film received a limited theatrical release in North America on March 15, 2013. An English dub was recorded for this release directed by Gary Rydstrom and produced by The Kennedy/Marshall Company, who oversaw the English dubs for Ponyo and The Secret World of Arrietty. The release was licensed by Studio Ghibli to GKIDS. This marked the first time a Studio Ghibli film was not distributed by Walt Disney Studios Motion Pictures in North America since the 1999 North American release of Princess Mononoke by then-Disney owned Miramax Films. On September 23, 2013, a Blu-ray edition was released in the United Kingdom by StudioCanal. During the survey period between July 16 and 18, 2011, Bunkatsushin.com reported From Up on Poppy Hill had grossed 587,337,400 yen at the box office, placing third. During these three days, over 445,000 people watched this film. In a survey which was done online and on mobile platforms, it was revealed the ratio of female audience to male audience was 57% to 43%. By age, 34.8% of the audience were in their twenties, 18.9% of them were ages between 16 and 19 years old, and people who were aged over 30 made up 32.6% of the audience. This film crossed the 3 billion yen gross mark during the weekend of August 21–22, 2011. From Up on Poppy Hill earned $1,002,895 in North America and $60,456,530 in other territories for a worldwide total of $61,459,425. It is the 14th highest-grossing anime film. Between Grave of the Fireflies, Only Yesterday, Ocean Waves, Whisper of the Heart and My Neighbors the Yamadas, From Up on Poppy Hill is the highest grossing Ghibli film about specialising in Japanese local customs, behind The Wind Rises, and its 7th best grossing one of the Ghibli films in United States. In France, the film was well received by the public. It gathered over 287,281 viewers in its four weeks of exhibition far more than Tales from Earthsea (in 2007, with 143,641 viewers). 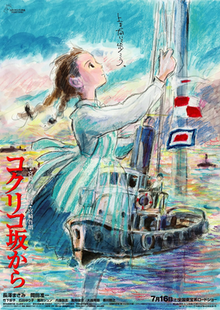 From Up on Poppy Hill received generally positive reviews from film critics; Rotten Tomatoes sampled 83 reviews and judged 84% of them to be positive with an average rating of 7/10, and the consensus: "Gentle and nostalgic, From Up on Poppy Hill is one of Studio Ghibli's sweeter efforts—and if it doesn't push the boundaries of the genre, it remains as engagingly lovely as Ghibli fans have come to expect". Metacritic, which assigns a weighted average score, rated the film 71 out of 100 based on 20 reviews. Mark Schilling of The Japan Times described From Up on Poppy Hill as a "pure-hearted, melodramatic youth film". The reviewer criticized the story as "predictable" and called the direction "pedestrian". However, he concluded the review by praising the film, saying "a wealth of period detail brings the era to nostalgic/realistic life". Takashi Kondo of The Daily Yomiuri said that it "is filled with many experiences that have been lost in our daily life". Kondo also said that "the father-son joint production [of Hayao and Gorō Miyazaki] achieved a wonderful result and [From Up on Poppy Hill] is a work that needs to be seen in this day and age". A. O. Scott of The New York Times praised From Up on Poppy Hill for its visuals as well as its characterization. Although Scott said that the "specific tragedy that lies in the background may not register with children," he would say that adults are "likely to be charmed by the love story and enchanted by the delicate rendering of a bygone but not entirely forgotten era". Kenneth Turan of the Los Angeles Times called the film "a time-machine dream of a not-so-distant past, a sweet and honestly sentimental story that also represents a collaboration between the greatest of Japanese animators and his up-and-coming son." Turan also said that Latin Quarter "is "Poppy Hill" at its most fantastical." On the characterizations, Turan stated, "the respect and politeness with which all the characters, even the teenage protagonists, treat one another is a far cry from what can go on in this day and age." In France, the film was favorably received by the press although the script and animation were judged to be slightly lacking by some. ^ "FROM UP ON POPPY HILL (U)". British Board of Film Classification. April 24, 2013. Archived from the original on May 4, 2013. Retrieved April 24, 2013. ^ Robles, Manuel (2013). Antología Studio Ghibli: Volumen 2. Barcelona: Dolmen Editorial. p. 73. ISBN 978-8415296935. ^ "From Up on Poppy Hill (2013)". Box Office Mojo. Internet Movie Database. Archived from the original on April 20, 2013. Retrieved April 15, 2013. ^ ""From Up on Poppy Hill" Foreign Total Gross". Box Office Mojo. Archived from the original on November 10, 2013. Retrieved February 24, 2014. ^ "Box Office Leaders". Motion Picture Producers Association of Japan. Archived from the original on September 23, 2015. Retrieved July 23, 2015. ^ a b c Hopewell, John; Keslassy, Elsa (June 5, 2012). "GKIDS plants N. American flag on Poppy Hill". Variety. Reed Business Information. Retrieved June 6, 2012. ^ a b Trumbore, Dave (October 5, 2012). "Studio Ghibli's From Up on Poppy Hill English language cast announced, including Gillian Anderson, Ron Howard, Anton Yelchin and Christina Hendricks". Collider.com. Archived from the original on December 11, 2012. Retrieved October 5, 2012. ^ "Behind The Voice Actors - Voice of Hana Matsuzaki". Behind The Voice Actors. Archived from the original on April 6, 2015. Retrieved November 18, 2013. ^ "Behind The Voice Actors - Voice of Hokuto Miki". Behind The Voice Actors. Archived from the original on June 1, 2016. Retrieved May 4, 2016. ^ "Behind The Voice Actors - Voice of Saori Makimura". Behind The Voice Actors. Archived from the original on June 25, 2016. Retrieved June 6, 2016. ^ "Post-War Warriors: Japanese Combatants in the Korean War". The Asia-Pacific Journal. July 30, 2012. Archived from the original on October 3, 2013. Retrieved September 23, 2013. ^ "Townscape Information: Yamate, Yokohama". Enjoy Network Japan. September 30, 2013. Archived from the original on April 3, 2015. Retrieved November 14, 2013. ^ "長澤まさみ、ジブリ『コクリコ坂から』主人公の声に抜てき！思いを寄せる少年演じるのはV6岡田准一！" (in Japanese). Cinema Today. May 13, 2011. Archived from the original on September 14, 2011. Retrieved September 27, 2011. ^ Official website "Studio Ghibli • Nippon Televi • Dentsū • Hakuhōdō DYMP • Walt Disney Pictures • Mitsubishi Shōji • Tōhō teikei sakuhin"
^ Keegan, Rebecca (March 8, 2013). "Goro Miyazaki sets his own path in animation". Los Angeles Times. Archived from the original on March 13, 2013. Retrieved March 9, 2013. ^ a b Murphy, Mekado (March 7, 2013). "Inside Studio Ghibli's 'From Up on Poppy Hill'". The New York Times. Archived from the original on March 18, 2013. Retrieved March 9, 2013. ^ a b c d Ishikawa, T. "From Up on Poppy Hill voice cast". From Up on Poppy Hill official page. Archived from the original on March 8, 2013. Retrieved March 17, 2013. ^ "From Up on Poppy Hill's English Dub Writer Revealed". Anime News Network. September 9, 2012. Archived from the original on September 12, 2012. Retrieved September 9, 2012. ^ McNary, Dave (October 5, 2012). "'Poppy Hill' sets high-profile voices". Variety. Reed Business Information. ^ a b c 九ちゃん「上を向いて歩こう」が「コクリコ坂から」挿入歌に (in Japanese). Yomiuri Shimbun. April 26, 2011. Retrieved September 29, 2011. ^ a b French Box office on AlloCiné Archived February 7, 2012, at the Wayback Machine. Retrieved on January 31, 2012. ^ a b "TIFF List 2011: The Announced Toronto Film Festival Lineup". indieWIRE. August 17, 2011. Archived from the original on February 24, 2012. Retrieved August 18, 2011. ^ "Studio Ghibli "From Up on Poppy Hill" English cast". collider. October 5, 2012. Archived from the original on January 25, 2013. Retrieved March 4, 2013. ^ "Studio Ghibli's From Up On Poppy Hill Heads to the US in 2013". ComingSoon.net. June 6, 2012. Retrieved June 28, 2014. ^ Langshaw, Mark (June 7, 2012). "Studio Ghibli's From Up On Poppy Hill gets Western release date". Archived from the original on May 2, 2014. Retrieved June 12, 2012. ^ "From Up on Poppy Hill Out Now". Studiocanal. Archived from the original on September 24, 2015. Retrieved February 4, 2015. ^ a b "国内映画ランキング(2011年7月16日～2011年7月17日) - 映画.com". Eiga. Archived from the original on April 16, 2015. Retrieved April 25, 2015. ^ "From Up on Poppy Hill on Box Office Mojo". Archived from the original on May 13, 2013. Retrieved July 1, 2013. ^ a b "Anime". Box Office Mojo. Internet Movie Database. Archived from the original on April 26, 2012. Retrieved April 27, 2012. ^ "From Up on Poppy Hill". Rotten Tomatoes. Flixster. Archived from the original on March 17, 2013. Retrieved March 17, 2013. ^ "From Up on Poppy Hill". Metacritic. CBS Interactive. Archived from the original on March 18, 2013. Retrieved March 17, 2013. ^ a b c "From Up on Poppy Hill (Japan. title: Kokuriko-zaka Kara)". The Japan Times. July 22, 2011. Archived from the original on December 19, 2012. Retrieved August 15, 2011. ^ a b Kondo, Takashi (July 15, 2011). "Set in 1963, 'Kokuriko-zaka' recalls precious memories". The Daily Yomiuri. Yomiuri Shimbun. Archived from the original on July 17, 2011. Retrieved September 9, 2012. ^ Scott, A. O. (March 14, 2013). "'From Up on Poppy Hill', written by Hayao Miyazaki". The New York Times. Retrieved March 15, 2013. ^ Turan, Kenneth (March 21, 2013). "'From Up on Poppy Hill' a sweet triumph for Miyazaki duo". Los Angeles Times. Archived from the original on December 18, 2013. Retrieved December 7, 2013. ^ « La Colline aux coquelicots : au temps des jeunes Japonaises en fleur », article from Thomas Sotinel in Le Monde du 10 janvier 2012 Archived February 14, 2012, at the Wayback Machine. Retrieved on January 14, 2012. ^ "40th Annual Annie Awards Winners". annieawards.org. International Animated Film Society. Archived from the original on January 28, 2013. Retrieved December 9, 2014. ^ "2013 Chicago Film Critics Association Award Winner". www.rottentomatoes.com. Archived from the original on April 9, 2015. Retrieved November 30, 2014. ^ Joey Magidson (January 13, 2014). "International cinephile society nominations". Awardscircuit. Archived from the original on February 27, 2014. Retrieved February 23, 2014. ^ Adams, Ryan (December 20, 2013). "Utah Film Critics ###". Awards Daily. Retrieved December 20, 2013. This page was last edited on 1 April 2019, at 09:39 (UTC).